With a registered ease and pleasant smile, Myla Smith and her guitar music carry more charm than Michael J. Fox in the ’80s. The Memphis singer/songwriter has carved her niche with sweet-yet-intense songs with relatable lyrics and a penchant to make you feel good. 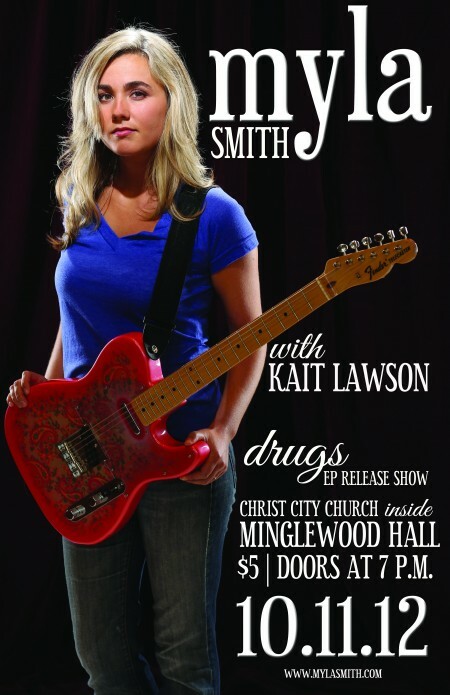 Tonight holds the debut of her latest release Drugs at the Christ City Church inside of Minglewood Hall. I got to lob a few questions at Myla Smith about Drugs. What does Drugs mean to you? I think you can define a “drug” as anything that you use to medicate, intoxicate, heighten your senses, dull them, or—here’s a big one—distract yourself. If you define it that broadly, drugs can look likea lot of different things. The thing they all have in common is that they are all temporary. All drugs wear off. I feel like the age we are living in now is chock full of “drugs,” and I wanted to explore that on this record. The juxtaposition of the cultural implications of the word “drugs” with the bouncy, colorful and eye-catching art on the album cover is interesting choice… Were you trying to elicit any certain mindframe for the listener before they heard the music? I knew I had to be careful with the art, because that title could make people leap to a “parental discretion advised” conclusion that would misrepresent the record. I wanted it to be thought-provoking, but not gritty. So we decided to illustrate a sort of modern-day drugstore, very bright and colorful, like the record itself. I think the “What Your Fix?” signage above the drugstore door really sums up the record concept. You’ve spoken before of the impact falling in love has had on your songwriting and music career in general. With your marriage and the release of your last EP (White/Gold) on the same date, has the time together impacted your music? I can’t say enough good things about my husband Richard. More than influencing my material, he’s just influenced my confidence and my work ethic. He is so emphatically supportive of what I do, and gives me the freedom to do it. I don’t know how many wives can say that about their husbands, so I count myself tremendously fortunate. He’s a musician too, and some people thought that might breed competition between the two of us, but the opposite has actually proved to be true. We are each other’s biggest fans. Do you find that Drugs contrasts or builds upon the sound you’ve laid down in Amid the Flood and the White/Gold EP? Folk is sort of at the core of who I am as a writer, so I think you will see elements of that in all the projects I’ve done. With this record, I intentionally chose songs that were more upbeat that we could have fun producing and be creative with. Sonically, Drugs is just bigger than the stuff I’ve done before. To me, every song sounds wide-screen cinematic. Drugs is a very enjoyable listen that’s easy to get into. I’m excited to see where you’ll go with it! Have any plans for the rest of the year? Thanks, glad to hear you’re enjoying it! (laughs) I should probably take a break, but I’m already plotting my next project! I’ll be playing some shows around the Southeast this fall, so if you get a chance to make it out to any of them, you’ll hear some contenders for the next record. You can catch Myla, her music, and her overt charm at Christ City Church inside Minglewood Hall. She’ll be joined by the equally as talented (and lovely) Kait Lawson. D00rs are at 5pm, and tickets are $5.